Not too long ago, groundhogs across the United States were pulled from their burrows and expected to see or not see their shadows. The most famous, Punxsutawney Phil, did see his shadow and predicted six more weeks of winter. Given the humor in expecting a rodent to produce a seasonal forecast for an entire country, it’s easy to ignore such a thing…especially if you don’t like the outcome. But could he be right for the wrong reason? And why do we do this anyway? There are grains of truth in this—fair conditions in northern Europe tend to imply cold temperatures brought from Siberia, while clouds and precipitation imply warmth brought from the Atlantic. Both of these can be tied to something called the North Atlantic Oscillation, a measure of how wavy (usually colder) or not (usually warmer) the wind pattern well above the ground in Europe is. That pattern is something that tends to favor one state more often than the other much of winter, so there is some chance that early February is a preview of the rest of February and March. Bringing this to the United States frays the connections—some areas can have many fair and warm days (more likely in the Plains and west of the Rockies), while clouds can be tied to cold (lake effect snow areas know this well). The Northeast is closest to and most affected by the North Atlantic Oscillation, but what predictive ability there is left here or in Europe is effectively removed by reducing the observation to one time on one day. Nonetheless, northern Europeans migrating to the United States many years ago did bring the tradition and chose the US-native groundhog as the mascot of this day. Still, everyone is left wondering whether there will be an early start to spring and warmer temperatures. No one—human, marmot, or other—can tell with total accuracy. That being said, our best assessment is that the answer is ‘yes’ spring will arrive earlier to the South and West, but not in the Midwest and Northeast. That doesn’t mean that there can’t be a few cold days in the South or West, but it looks like temperatures in February and March are more likely to be warmer than normal overall. For the Midwest and Northeast, conditions will be colder than normal overall—but a warm break or two can’t be ruled out. Keep in mind that ‘normal’ here refers to the 1981-2010 average temperature through the next six-weeks. 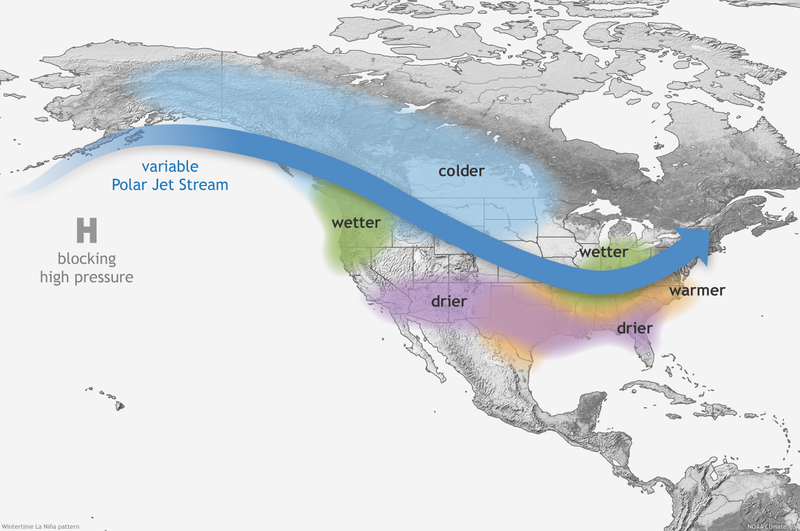 Why will it be cold in the north and warm south? If you read “Why Is It So Cold?”, you may remember that the polar vortex in early January was only nudged off the North Pole toward us. This time, it appears a full-on split of the polar vortex is underway with one piece ending up in Canada and the other in Russia. Having a piece of the polar vortex right next door makes it more likely for cold air to be able to push south into the northern US. On top of that, we are still in a weak La Niña that favors warmer conditions in the Southeast, something that tends to become stronger later in winter. As for the West, we expect a continuation of the general pattern so far this winter to keep conditions generally warmer and drier than normal there. Overall, it looks like Punxsutawney Phil had it half right. Construction is a challenging field. Prioritizing your client’s vision within the parameters of engineering and cost can be difficult to say the least. Events consistently arise from the initial planning of the project to finalization that test those limits. Most formidable are the inevitable delays that occur during construction. Ideally, delays are best addressed in the early stages when strategic planning can reduce this type of setback. Completely halting work to deal with a delay can affect sub-contractors, schedules, permits, and most importantly it can escalate overall costs and push the completion date out. Moreover, if Old Man Winter comes early or spring/summer rains bring torrential downpours those delays can become a costly and insurmountable obstacle. Precipitation, extreme heat, temperatures in the negatives, wind gusts…weather is one of the most commonly cited causes of construction delays. In the past, to assess reasonable costs and delays associated with adverse weather, a knowledgeable contractor used weather data to determine the likely number of non-optimal days (those days affected by adverse weather conditions such as heavy precipitation, extreme hot or cold, etc.) to complete a bid. While this may have been standard protocol in the past, climate change has made using data to predict seasonal or annual weather extremely difficult. Simple calculations using historical weather data can no longer be used effectively to gauge the potential days lost due to adverse weather. Weather patterns have changed and there is greater uncertainty of what the weather will bring with climate change impacting weather. Weather delays are often determined to be no-fault. Further, weather loss tends to be non-compensable, so as a crew watches the heavy rains come in from the security of their cars they still need to be paid. The job is not moving forward but the financial obligations are still there and your overhead costs are going up and up. In some cases, delays can be so sizable and excessive due to adverse weather force majeure may be indicated as the cause of delay. Force majeure, sometimes referred to as the Act of God clause, is failure to uphold a contract due to unavoidable or uncontrollable events like extreme weather events. To prove a force majeure event, a party must demonstrate that the event occurred, it was out of their control, the event prevented or delayed performance, and plans to lessen or prevent impacts were attempted. Adverse weather can tiptoe or plunge headfirst into this category and can be an allowable pretext in breach of contract suits, which can sometimes be favorable to a contractor. However, a breached contract requires litigation, lost time, mounting expenses, and potentially a tarnished reputation within a community. Force majeure is sometimes seen as a cost of doing business, but does it have to be? Abnormal weather conditions are becoming normal, and businesses must have added protection against this new normal. There are solutions to help mitigate your risk from adverse weather and its impact. First, you can write a contract that has you and your client’s best interest in mind distributing weather risk evenly between parties. Weather delays are often non-compensable, which can cause large financial losses to a construction company. Today, a contractor may extend their ability to utilize weather claims with a contractual clause. This clause delineates that compensation will be paid to a contracting firm for extensive or excusable weather-related delays citing the necessity to cover costs in keeping crews and attentions devoted to this project. In this scenario, a client becomes responsible for some of the more extensive costs related to adverse weather claims. Secondly, utilizing a weather risk management product such as weather insurance or derivatives can help substantially reduce risk in cases of adverse weather conditions or a series of non-optimal days. These are highly specific and tailor-made products to suit a business’ or institutions’ needs to mitigate against adverse weather impacts. Weather perils such as excessive rainfall, days that are too hot, days that are too cold, wind, or a combination of elements can be insured against to lessen potential risk. For example, a job often begins with foundation work. Concrete pours have several limitations in regard to optimal temperatures and conditions. If adverse weather delays this portion of the construction process, there will be a stall and trigger delays on other portions of the job. Sub-contractors may be unavailable with this new timetable and the building schedule will never hit its anticipated deadline. Losses are now imminent. For those jobs that are most impacted by weather, e.g. excavating, framing, concrete, landscaping, weather insurance can be utilized for a very specific customizable period to lessen risk from adverse weather events. Coverage could simply be purchase for the duration of this process or it could be purchased for the extent of the entire project. Any business can purchase weather insurance, so if a payout is triggered, compensation goes directly to the purchaser—your business. Typically, National Weather Service data determines disbursements. Dealing with insurance adjusters and filling out long documents to “prove” your claim is not a part of this process. An awareness that delays will be a likely part of any operation is just a part of life. Foreseeable weather delays can sometimes be calculated for using NOAA data to anticipate the likelihood of adverse weather delays in construction. However, climate change and weather’s increasing unpredictably has made calculation of non-optimal days extremely difficult to determine. Weather has never been less predictable. The risk of having a non-optimal scenario during a long-terms project, or even in the short-term is increasingly probable. To lessen financial risk, it makes sense to have a well-written contract that considers some type of weather risk coverage to help eliminate the costs associated with the increased likelihood of adverse weather. With adverse weather conditions, losses are imminent. Protecting yourself and your business makes solid fiscal sense. So Cold – But Why? The biggest reason for the cold across the eastern and central US is a response to abnormal warmth in the western US, western Canada, and Alaska. The ‘Alaskan ridge’, or abnormal warmth several miles above eastern Alaska, Yukon, and the Pacific coast typically leads to an equal but opposite reaction to the east–known as a ‘trough’, or abnormal cold several miles above the eastern and central US. This ridge-trough pattern then proceeds to repeat and encircle the globe (think waves on the ocean), creating areas of abnormal warmth and coldness throughout the Northern Hemisphere. On average, these temperature abnormalities above the surface are reflected at surface level thanks to the storm track arcing over the ridge and under the trough. Low pressure going through Alaska or western Canada pulls warmer air north into Alaska and prevents much rain from reaching south to California. The storm track then runs southeast through Alberta (hence the name ‘Alberta Clipper’ for systems following the track), into the Plains, and close to the East Coast pulling down cold air dislodged from its formation area in northern Canada/Alaska. To see the effect of removing that cold air, consider that Fairbanks, Alaska has highs of around 15 degrees and no sub-zero lows forecast this week. Compare this to normal highs around 2 and normal lows around -15. In a normal cold air outbreak, plentiful snow cover in the eastern and central US will prevent the ground from absorbing sunlight and re-radiating that energy to warm the air passing overhead. The unique aspect about this cold wave is that snow cover is only near average for early January–instead, the cold air is intense and fast-moving enough to sustain its intensity well into the southern US despite passing over bare ground south of the Ohio River. Where there is snow north of the Ohio River, it’s just that much colder. The temporary snow cover in the Southeast is similar, creating a few nights and days colder there than would occur without the snow. All of this works well to chill the Plains, Midwest, and Gulf Coast, but the eastern US has one more piece to solidify the deep freeze there. The storm track arcing back north along the Atlantic coast towards Greenland allows any low pressure following the track to feed off of the temperature difference between the cold air over land and warmth along the Gulf Stream. This leads to near-perfect conditions for rapid strengthening of the low pressure allowing it to pull in additional cold air from the Hudson Bay region in Canada as the low pressure heads out over the ocean. Whether or not the low pressure lines up right to produce snow at the coast, the cold air is still getting there. What about everyone’s favorite wintertime phrase, the ‘polar vortex’? In this case, it appears to be nudged a bit off the North Pole from below by the pattern that is creating the Alaskan ridge–keep in mind that the polar vortex exists more than 10 miles above the ground, while the ridge-trough pattern is most prominent 5-10 miles above the ground. That nudging helps to direct the cold air out from under the polar vortex further south into the US, but the polar vortex itself is still stretched from eastern Canada across Greenland to Siberia. What Does This Mean for California and the Southwest? Finally, this setup does no favors to California and the Southwest. The storm track being deflected well to the north prevents rain from reaching those regions, enhancing the fire danger in this normally wet season. These dry areas will need to hope that the Alaskan ridge breaks down to let the storm track run off the Pacific or that there can be low pressure that sneaks south of the ridge, bringing a more active storm track to northern Mexico that can waver into California. Some may recognize bits of La Niña in the results of this pattern (dry California, cold northern US)—we are currently in a weak La Niña state and should remain in one until spring. La Niña may help a bit to set up the pattern, but the fact that we were in a similar state last year should remind everyone that this cold should not be expected from every La Niña.